Cameron's week started off with an impromptu trip to Ada Park with both of his parents after work... it was such a beautiful, warm fall day, the family had to take advantage of the great weather. 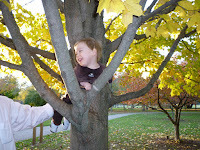 Cam had a great time playing in the leaves, exploring all of the different colors and textures. A new adventure he experienced was going down the big slide with his mom. He wa sn't scared at all and giggled when they reached the bottom. Chris thought that Cam might want to try a little tree climbing and push-ups on some branches. Of course, a little "daddy" assistance was needed for this exercise, but Cameron really enjoyed himself. The rest of week was filled with typical Cameron activities: trying out different foods (melon is his new fav), continuing his daily walking, and of course, playtime. Saturday and Sunday were a big treat for Cam- Grandma & Grandpa came in Saturday to spend the night and take care of Cameron while Chris & Jane ventured north for a wedding and then back to GR to see 'Big Sis' Lauren. On Sunday, after Cameron slept in until a little after 10 (! ), the entire family went out for brunch at Sundance. Great food and a great big thanks to Grandma & Grandpa for Cam-sitting! !